You may have read, everywhere, that Evernote has bought the company that developed the Penultimate app. 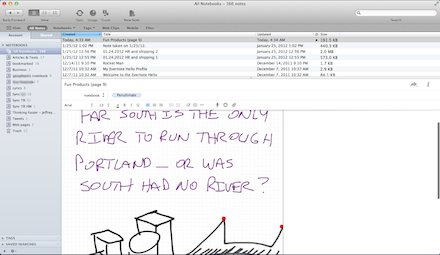 Evernote is the free text note and image cloud service for your desktop and iPad. 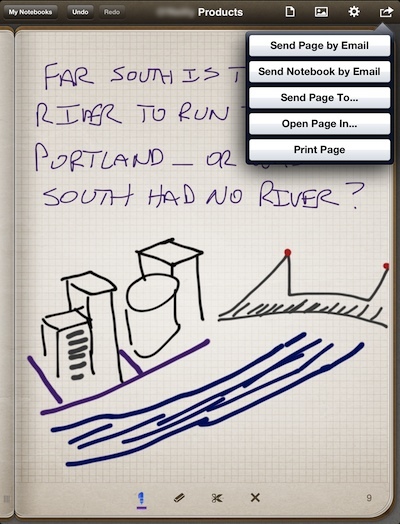 And, Penultimate is the bound notebooks on the iPad with pages to flip through for drawing and handwriting. In both cases, software we use every day. The ability to save your Penultimate creations to Evernote has been around a long time. It isn’t a feature brought about from the two companies joining. When working on a note, choose the share button in the upper right corner of the page to ‘Send Page To…’, choose Evernote from the list of options (Dropbox free cloud storage is another option when needing to share). 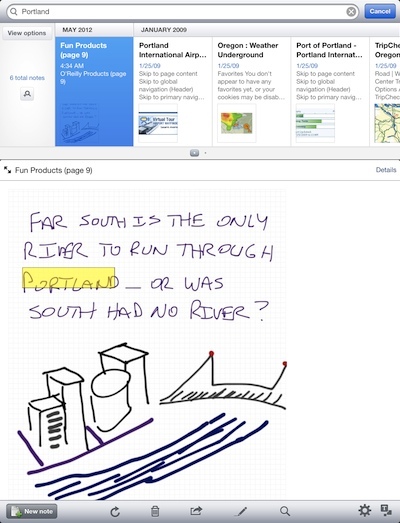 The ‘send to Evernote’ feature in Penultimate can be tuned. Choose which folder in Evernote you want the note to go to. The Advanced option is where you choose how you want full notebooks sent to Evernote to be handed, as individual notes or all pages in the notebook to a single Evernote note. This tuning is available through the settings area and does not pop up when choosing to ‘sent to…’. 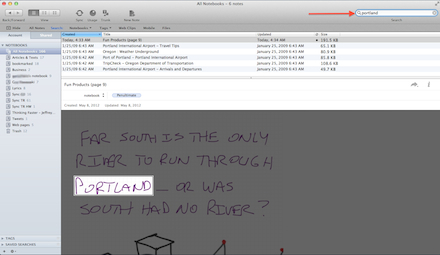 Start up the desktop Evernote, sync and the Penultimate handwritten/drawn page appears as a new note. 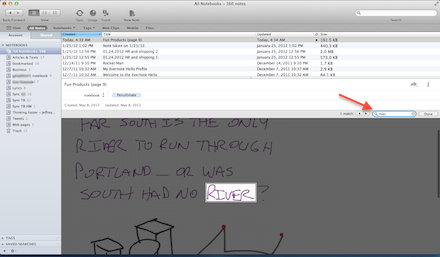 You can move the note to another folder, save the page out to another desktop app, as well add typed text to the page. Now the magic… by moving the handwritten iPad Penultimate note through Evernote’s cloud, a recognition engine is run against the document. This feature does NOT change the handwritten text to typed (OCR), but it does tag the handwritten words so a search will find words within the written text. Note though that the engine can be fooled by bad handwriting, it found the lower ‘river’ but not the upper one where the ‘v’ is smaller and runs into the ‘e’. Searching in the desktop Evernote software can be done across all documents too via the entry box in the upper right corner. There is a Evernote iPad app too. Once you sync your Penultimate notes to Evernote, they appear on the desktop software and iPad Evernote app too. 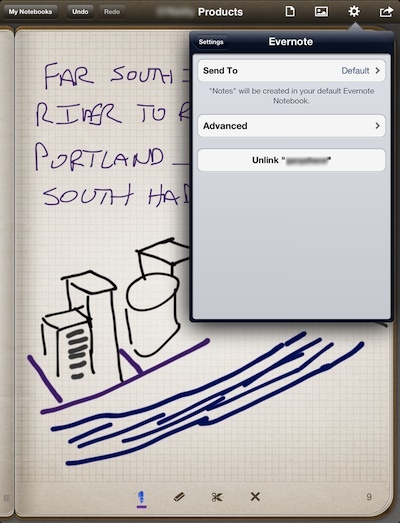 Selecting the note is similar to the desktop app. 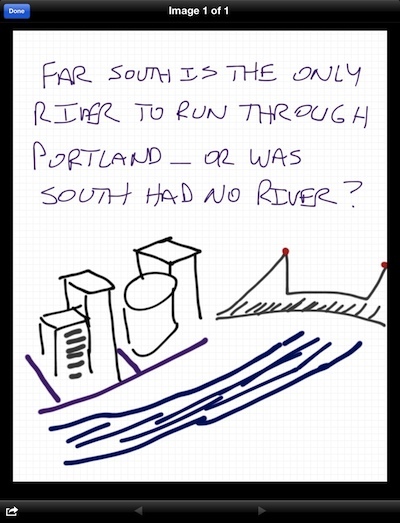 If you click on the Penultimate actual note, Evernote opens it on the iPad as an image file that you can share or open in another app. And, since the note went to the iPad Evernote app via the Evernote cloud service, the search works on the handwritten text on the iPad too! So, the Evernote app has both notes you typed directly into it and handwritten notes from Penultimate, allowing all to be grouped together per event or project.